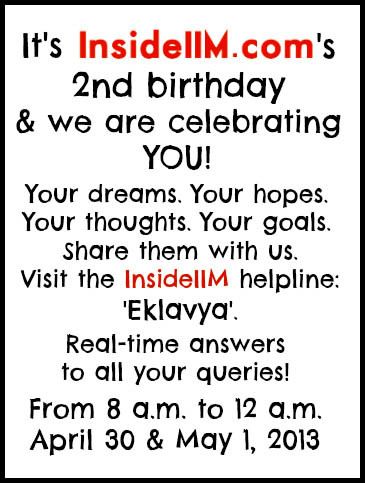 InsideIIM.com turns 2 tomorrow! You made us. We wouldn’t be what we are today without you. We have a few things planned for the next few days for you. ‘Eklavya’ – our helpline, has been used extensively by management education aspirants, current students and even some alumni for the last 18 months. Currently, all queries are answered by e-mail. We reply within 24 to 48 hours. We realize it is a crunch decision making time for everyone right now. Whether it is choosing the right business school or deciding to take the CAT again, you need a sounding board. Whether to take up GMAT coaching or to go abroad there may be confusion you need to clear. You may be a summer intern and things are not going your way? Maybe we could help. Not happy with your current job? Need to figure out the switch? We can talk to you! And we make it very simple for you. Login to your Gmail /Google chat and add eklavya@insideiim.com. 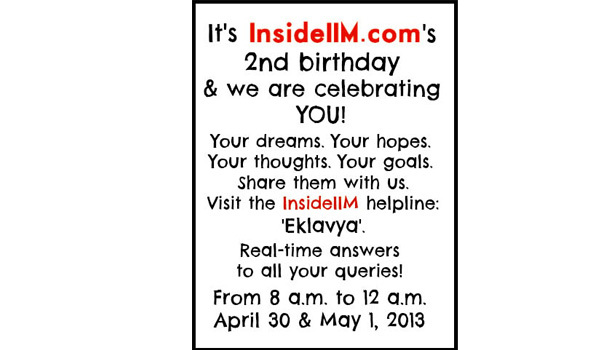 We will talk to you real-time from 8 am to 12 am (16 hours) on April 30th and May 1st 2013. Someone will always be there to talk to you. You may be asked to wait in case the subject matter expert is busy on another chat. This counseling service is free and be assured that anyone speaking to you has been to one of the top schools in India featured on this website. Am not from a top rung college but a regular visitor of this site as it throws lots of good things.If possible could you tell me the carrier growth in the field of Transaction banking in terms of international exposure,higher position and off course monetry benefits.Just tell me on the basis of these alumni datas. We will surely answer your query and any other. Just request you to either send an email to the regular channel of Eklavya or chat with us from 8 am to 11:59pm (anytime in these 16 hours) tomorrow or day after tomorrow. Sir/Madam, I had sent an invite to insideiim to add to my contacts (from sattyaj.007@gmail.com) but no one had added me yet. Please help. Should i go for AXIS bank PO or should i do another job and do MBA after 2 years work ex? Just to get a better idea of this.. This is by alumni of these colleges or by students currently studying.